When we launched the adidas content hub, www.GamePlan-A.com, in May 2016, we put culture at the core of our content marketing strategy. The goal of this venture is to engage employees and attract the right talent and build relationships with like-minded people (be they internal or external) who have a cultural background compatible to our own. While all of this will help create advocacy in the long term, driving revenue isn’t a primary goal of GamePlan A. Did I just lose you? Bear with me. I promise, making culture a driving force of your content marketing strategy will help you enormously to create sustainable ROI because culture has the power to nourish longer-lasting, stronger, and more-engaged relationships with your target audience. Let’s see how this connects to content marketing. There’s no doubt relevance is one of the most important aspects in content marketing. But relevance is a tricky thing; relevance is fleeting. If my favorite soccer club scores a goal, it is only exciting until the other team equalizes. A unique selling proposition is only particularly relevant when I made the purchase. Even a website that provides me with knowledge is only relevant until my focus switches to a different area of expertise. Because relevance is fleeting, I like to compare it with waves reaching the coast. There is only a short moment when it is just the right time to take off and surf the wave. As content marketers, it’s our job to build a user journey that creates a continuous flow of moments of relevance that leads the user from awareness to purchase and retention. This is really hard work. The most frustrating part is that the likelihood that a consumer loses interest between two moments of relevance is high. If relevance comes in waves, the question is what makes the surfer sit in the cold water and wait for another set of waves knowing many other surfers are fighting for the same wave? What makes the surfer fight against riptides and suffer being spun around underwater after falling? It is something much bigger than the waves themselves. It’s the emotional connection the surfer has with the water. It’s the conviction that the feeling of riding just one wave will outweigh all the efforts and sacrifices. It is the surfer’s love for the lifestyle connected to the sport. In short, what makes the surfer hang on is the culture of surfing. If you take just one lesson from this article, I hope it will be the following: Culture is the one factor able to sustain the groundswell of relevance necessary to build long-lasting relationships. We need to speak through the filter of culture to our audience because culture is the connector between all the moments of relevance. I am convinced content marketers need to find more and better ways to make culture a driving force of their strategies. The easiest way is to use content to connect your target audience to your own organization’s culture. It’s not enough to gather some qualitative insights to understand your target audience. Make sure your content marketing program embodies a clearly defined culture itself. How? We at adidas learned a lot in our debut year with GamePlan A. I share those lessons along with some simple steps you can take to build cultural relevance. What is it that makes your culture unique? Go wild and gather as much information and insights as possible. Speak to your employees, customers, and partners. Maybe your company is innovative and continuously finds new ways to connect the dots? Is your staff famous for being super fun to work with and super efficient at the same time? Whatever cultural characteristics you have – find and validate them. At adidas, everything we do is rooted in sports. But GamePlan A does not build relationships only with people who love sports. That lone quality isn’t sufficient. When you work at adidas, behaviors such as creativity, collaboration, and confidence play an important role. Thus, GamePlan A is designed to build relationships with “creators and entrepreneurial minds with an athlete’s heart.” Our research showed a big segment compatible with our own culture. This is the important part – it’s not enough to just find what defines you. You also must find out how your cultural characteristics are relevant to the target audience you want to speak to. You need to bring your own culture in sync with what your product offers and what your customer base looks like. If they aren’t aligned, you should think of changing one or the other. Your content needs to be authentic. People will smell it if your culture is fake. However, if it is real, you’ll get the opportunity to build meaningful and long-lasting relationships. The strategy of GamePlan A is to address a target audience found externally as well as internally and speak to them at the same time through the same filter of cultural relevance. To inform our strategy we did comprehensive research to identify the biggest common denominator between us and our external audience. Who we are, what we communicate, and whom we talk to are all in sync. As soon as you know which attitudes, behaviors, ideas, and values you want to convey, apply this cultural filter to every piece of content you distribute. Don’t just hide a description of who you are in the About section of your company website. We, for example, created content guidelines as well as an “author’s journey” for GamePlan A, which can be used by any creator who needs to find a relevant hook for a topic we want or need to communicate via GamePlan A. The journey ensures that our content is always speaking through GamePlan A’s cultural filter. The easiest way to make your cultural filter work is to get your own employees on board. This creates trust, personality, and authenticity. On GamePlan A, our employees, partners, athletes, and all-day heroes take an incubator role for the community by sharing their experiences and perspectives on living a sport-infused work life. But we also invite anyone else with an athlete’s heart to contribute to the conversation. We curate third-party articles to GamePlan A and host a dedicated contribution site where our community can submit content and ideas, and suggest role models to talk about. Letting your community shine makes it more engaging and creates pride and a sense of belonging. It authenticates and nourishes your own culture at the same time. Data-driven decisions are extremely important. But don’t let yourself be blinded by the numbers. Conveying cultural relevance is a lot about social intelligence and empathy. Soft factors and insights can’t be captured by data efficiently. Moments were never created based on spreadsheets. Moments are made of cultural and emotionally charged aspirations. Now the challenge is on you: What will you do to find more or better ways to connect your audience with your organization’s culture? Let me know in the comments. 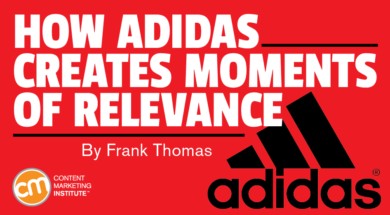 To learn more about the strategy behind GamePlan A and how adidas built and measured the content platform, attend Frank Thomas’ session at Content Marketing World Sept. 5-8 in Cleveland, Ohio. Register today using code BLOG100 to save $100.